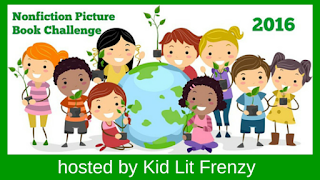 I am posting twice today because I'm also on a blog tour thanks to The Children's Book Review. 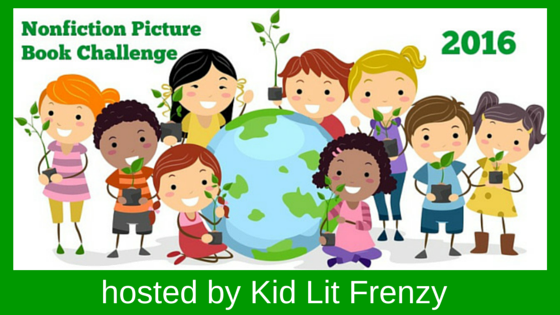 Go to my post here to read about the newest addition to a geography series, and a giveaway! Funny Bones: Posada and His Day of the Dead Calaveras, written and illustrated by Duncan Tonatiuh, is the Sibert Award winner. - Need to read! Drowned City: Hurricane Katrina and New Orleans, written and illustrated by Don Brown - Read, loved it, and predicted! The Boys Who Challenged Hitler: Knud Pedersen and the Churchill Club, by Phillip Hoose - Read, loved it, forgot it was a candidate! Turning 15 on the Road to Freedom: My Story of the 1965 Selma Voting Rights March, written by Lynda Blackmon Lowery as told to Elspeth Leacock and Susan Buckley, illustrated by PJ Loughran - Need to read! Voice of Freedom: Fannie Lou Hamer, Spirit of the Civil Rights Movement, written by Carole Boston Weatherford, illustrated by Ekua Holmes - Need to read, have it as of today! I wonder how it feels to illustrate a book about another artist. E.B. Lewis is an illustrator I imagine would feel honored. A beautiful artist himself, to help tell the story of someone who in life was only known in his close surroundings must have been a joy. 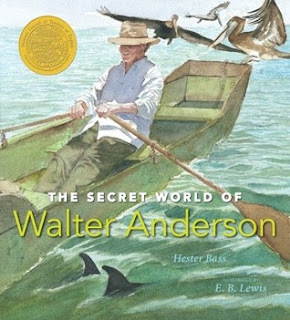 This book tells the story of Walter Anderson, an extraordinary artist who spent hours on an island alone capturing the beauty of a coastal waters habitat's flora and fauna. He went to great lengths to get details just right, like climbing high in a tree to observe a green heron's nest, or wading up to his shoulders to draw a sphinx moth against a pattern of bullrushes. He kept nature logs, read prolifically, and sometimes would draw images that he read, the book in one hand and the pen in the other. Walter's brothers also were artists and art of the living he made included drawing on pottery for one of them who opened what became a famous pottery shop. This book is a lovely introduction to Walter's story, supported in gorgeous paintings by E.B. Lewis. There is a long piece of text in the back of the book that tells more about Walter and about his extended family. There were surprises after Walter's untimely death at sixty-two, and a widening audience who finally discovered the talents of this "now-famous" American artist. What a beautiful story of the author's great-uncle, Lewis Henri Michaux. 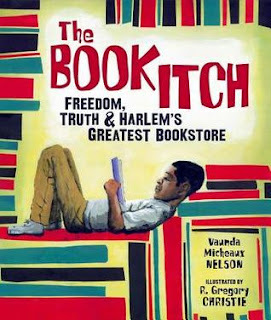 Imagine an African-American man with little schooling but knowing how important books and reading are to everyone, but especially his fellow African-Americans. Michaux tried to get a loan to open his bookstore, but was turned down, so he did every odd job he could, and saved the pennies. He started with a cart, selling books on the street, but finally opened a store, right around the corner from the Apollo theater. Many notables such as Muhammed Ali, Nikki Giovanni and Malcolm X frequented the store, and some spoke on the platform erected outside the store. Michaux thought it highly important that blacks educate themselves about their history. He was known for his fiery speeches, and eventually called The Professor. Christie's illustrations are beautiful portraits of this part of Harlem history, not exactly realistic, but when the famous are mentioned, a hint of what they looked like is there. The endpapers are filled with quotes from Michaux (Don't Get Took! Read A Book! ), and explained a bit more in the story. There is additional information and a bibliography in the back. I was very pleased with the winners of this year's Sibert award. And I loved The Book Itch. I'll have to seek out The Secret World of Walter Anderson, new to me and illustrator E.B. Lewis is a favorite of mine. Thanks, Alex, I was so glad to read The Book Itch too, knew nothing about this man or the bookstore. Both these biographies were wonderful stories. I know, have piles everywhere, but glad that my library has nearly every one I ask for. Enjoy these, Jane. They are good! I love the evocative paintings in the Walter Anderson book. I hadn't thought about how it would feel to be an illustrator trying to capture another artist's work. What a puzzle! And Book Itch is fantastic! Yes, those paintings by E.B. Lewis are marvelous. Glad you enjoyed the book, too! Linda, I do not know Walter Anderson either! I agree with you about the amazing biographical picture books that have been published recently. So many people to learn about! Anderson's story should be known. It's quite wonderful! Enjoy The Book Itch, too, Kellee! I just read The Book Itch yesterday and really enjoyed it. There are so many wonderful quotes about reading. I think my favorite was "Not every book is true, he says, but the more you read, the easier it is to figure out for yourself what is true." Yes, they were all good, helped me imagine the store even more. I loved the art, too. The Book Itch is one I need to get my hands on. I put it on hold at the library! Terrific, enjoy it. I really did. The Book Itch loos wonderful! I am now on the hunt for this one. Yes, it's good! Thanks, Carrie. I really liked it, Myra, hope you do, too!